Lately we’ve been testing the KiCad waters. For the ATX Breakout Board v2 we needed to escape Eagle’s PCB constraints, and we succeed. A major hurdle to using any new CAD package is that all your part libraries have to be built again. Luckily Sjaak pointed us to a script that helps you convert your library from Eagle to KiCad. We did hit a tiny snag in the conversion. All the squared pin 1 pins in the Eagle parts get converted with an error on that pin in KiCad. This is a small error compared with building each part from scratch. You can get our KiCad library from the SVN. Keep in mind we are just messing around with KiCad, there’s a ton of bugs in there we don’t know about. This entry was posted on Tuesday, September 18th, 2012 at 5:00 pm	and is filed under Eagle parts. You can follow any responses to this entry through the RSS 2.0 feed. You can skip to the end and leave a response. Pinging is currently not allowed. I am not confident enough with kicad to feel I can contribute back yet but how would someone go about reporting/correcting bugs in the parts data base? Bugs are reported at the bug tracker. If you want to discuss it first use the user or developer mailing lists. I am working on a site for sharing and moderating KiCad libs to make the whole process easier, keep a look out for the announcement. I am just starting out learning PCB design and I am using Kicad. Thank you for this. It gives me a place to start. I just made my first project in Kicad a week ago (a small EPM3032A breakout). I found that using this software feels pretty good, for some things it’s even easier than Eagle. The standard library is so incomplete and crippled ! I had to make a pad for a standard 8 pin header myself because they didn’t have it ! they had a 8 x 2 header, but it had too small pads. The software troubles you described last time all look like they can be corrected by very small changes in code, but the standard library should really be rewritten from scratch if Kicad wants to become a viable alternative to Eagle. Did you tried geda/pcb? I use these programs for a while, but not know Kicad. 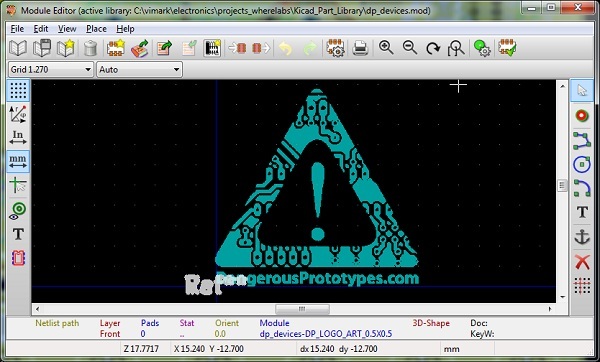 Did anybody make a comparicon between Kicad and geda/pcb? Wooow those look nice, there are even the 3D models !